The Lady Slipper orchids are all members of the orchid subfamily Cypripedioideae. If you hear someone talk about a "Lady Slipper," it is most likely that they are talking about a plant from the genus Cypripedium, particularly the Showy Lady's Slipper, Cypripedium reginae (which is also the state flower of Minnesota). They might also be talking about a Paphiopedilum, a Phragmipedium, or (less likely) Mexipedium or Selenipedium. Each genus within the subfamily is distantly related to the others; all are classified in their own tribes, except Paphiopedilum and Cypripedium, which are slightly less distant relatives and constitute the subtribe Cypripedieae. Intergeneric hybrids of Paphiopedilum and Phragmipedium are called Phragmipaphium. All Lady Slipper orchids have a pouch-shaped labellum. The idea is for pollinating insects to fall into the pouch and be unable to escape without climbing past the flower's column, where it either picks up pollinia or deposits them on the stigma of another flower, pollinating it. The slipper orchids also all have their two lateral sepals fused into a "synsepal," positioned behind the pouch. Each of the three main genera of Lady Slipper orchids has very different care requirements, so I'll talk about them separately. These are temperate orchids, and usually grow terrestrially in bogs in the wild. If you want to grow them, I hope you live in a temperate climate! (Otherwise you'll have to get creative with the refrigerator to simulate a "winter" for a few months. Some people do that quite successfully, though!) It's possible to grow these in pots, but it's much more fun to put them in the garden, so that's what I'll talk about! The Cyp. parviflorum in my backyard has 39 flowers this year! Choose a spot that gets direct sunlight for a couple hours a day, ideally in the early morning, and dappled shade for the rest of the day. It can help to take photos of the garden at several times of day to get a sense of where this is. Every year, the Cypripedium will start growing in the spring, bloom around June, and then die back for the year. 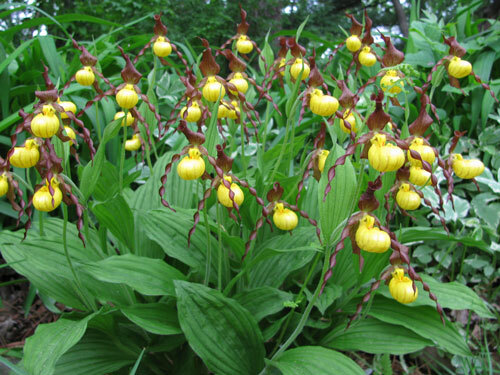 Some Cypripediums, such as Cypripedium grow rapidly, perhaps doubling the number of flowers each year. Others, such as Cypripedium reginae, the Showy Lady's Slipper, will grow much more slowly. 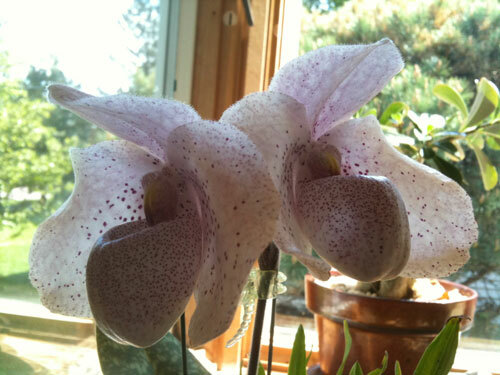 Paphiopedilums are Lady Slipper orchids native to southeast Asia. Some are terrestrial, others epiphytic. They do best with low lighting, such as that provided by an east window or a shaded south-facing window (in the northern hemisphere.) 1000 footcandles, similar to Phalaenopsis lighting, is more than enough. Plants with plain-colored leaves like a little more light than those with mottled leaves. Mottled-leaf Paphs like warm to intermediate temperatures, 70-85°F (21-30C) during the day. Plain-leaved Paps like cool temperatures, 55-65°F (13-18C.) They all appreciate a nighttime drop of 10-15°F (6-8C). They have no water storage organs, so they don't like to dry out too completely; water as they approach dryness. Phragmipediums come from South and Central America. 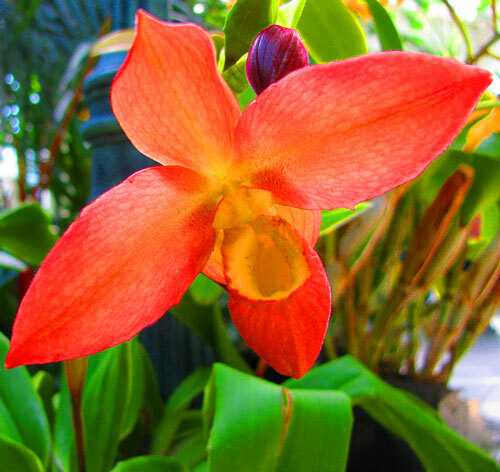 Some, such as Phragmipedium besseae and Phragmipedium kovachii, are VERY brightly colored. They tend to come from very wet habitats, often at the edges of streams, and bloom most often in the spring. Most species like a lot of water; water them daily, or even set them in a dish of water that you refill when it starts to get low. (If you're doing the latter, flush them thoroughly with water a couple times a week.) Note that Mexipedium xerophyticum, formerly classified as a Phrag but now known to be only distantly related, will NOT appreciate this much water; it should dry out briefly between waterings. Phragmipediums like warm temperatures between between 70°F (21C) and 85°F (29C) by day, with a drop of 10-15°F (6-8C) or more at night. Phrag. 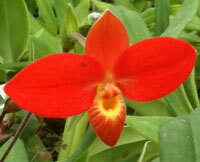 besseae is a beautiful red orchid (Phrag. besseae f. flavum is a yellow form of the species) with excellent color and shape. 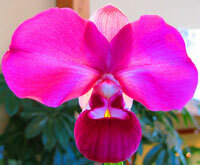 If I could have just one orchid, it would probably be this one. Phrag. kovachii, discovered in 2001, is the most remarkable new orchid of the last 100 years. The flowers of wild-type plants are 5-7 inches (14-18cm) across, by far the largest flowers in the genus.